It's a mistrial in Phil Spector's murder trial. The University of Massachusetts already has one graduate and one undergraduate course that focus on Grateful Dead, and now the school will take it a step further with a university conference on the enduring legacy of the Dead experience.Unbroken Chain: The Grateful Dead in Music, Culture and Memory will be held from November 16 to 18 at UMass Amherst and will bring together more than 50 presenters for 20 panel sessions ranging from music composition and improvisation to an examination of the band’s business model, as well as a musical performances, gallery exhibits, movie screenings and other presentations. Panelists will include “Mountain Girl” Carolyn Garcia, first wife of guitarist Jerry Garcia; David Gans, host of Grateful Dead Radio Hour for the past 20 years; Dead midi wizard Bob Bralove; and Dan Healy, who designed and built the “Wall of Sound,” famed enabler of the Dead’s improvisational style. There also will be a keynote address by Dennis McNally, longtime Dead publicist and author of Long Strange Trip: The Inside History of the Grateful Dead. “The academic world is not as removed from so-called reality as people think, especially those in the academic world,” said McNally. “In the Rock & Roll world, there are pockets of meticulous intelligence and literacy, people like Jerry Garcia and (bassist) Phil Lesh.” The weekend also will include performances by American Beauty Project and Dark Star Orchestra, whose rhythm guitarist Rob Eaton and keyboardist Rob Baracco will take part in several of the panel discussions. 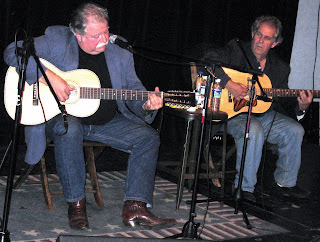 We started with Mark T. Small and Paul Geremia on Friday night...then Richard Shindell on Saturday night. Above, there's Paul Geremia not long after we coaxed him out of the dressing room where he was making sure his 12-string guitar was tuned. He tuned because he cared! Next to him is guitar wunderkind Tony Medeiros, of the Chili Brothers and other collaborations, who sat in a bit with Paul. By the look on Tony's face, what do you think he's thinking? Maybe we should have a caption contest! Down below is fleet-fingered blues cat Mark T. Small, who gave away his debut CD on Whaling City Sound to everyone who wanted one. It is fab, by the way, and not because it was free! 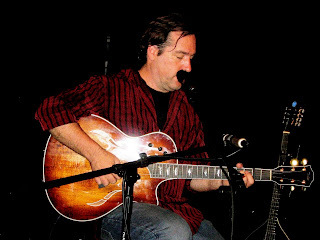 Above, Richard Shindell proves why he's the "thinking person's" folk musician on Saturday night, with lyrics that make you ponder without being ponderous. The Village Voice is reporting that the late Hilly Kristal--thought to be broke--was worth millions. He was the guy behind legendary NY punk rock club CBGB's. Not yet posted on the regular Narrows' schedule at http://www.ncfta.org/. If you dig acoustic classical guitar with a strong dose of pop and jazz, this show is for you. Pierre is from France but is known and loved in the USA and across the globe for his interesting tunings and different approach. Steve Vai says "Listening to Pierre Bensusan is rejuvenating. Beside his extraordinary touch and tone, the notes and melody appeal directly to the tender side of our human nature." 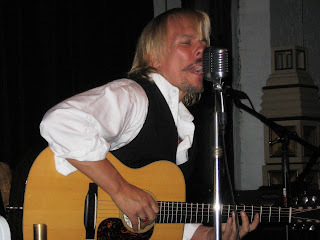 Leo Kottke: "Pierre’s music gives me the shakes. No other guitarist shares his strange gifts of sophistication, accessibility and downright joy. Even at its most complex, Pierre’s music only needs ears to be enjoyed." George Winston: "One of the truly gifted musicians of our time - he plays the guitar as if it were the very soul of himself." Most importantly, the volunteers at the Narrows love Pierre for his kindness and his willingness to share a glass of wine with everybody! www.pierrebensusan.com. Rolling Stone named his song "Origins of Species" in its top 100 songs for 2006. Jazz diva Diana Krall covers his "Love Me Like A Man" on her latest album. Get your tickets early for this one, as this folk/blues legend is hotter than ever! www.chrissmither.com. What can a poor boy do, but play in a rock 'n' roll band? With the Phil Spector verdict just hours away, it's probably appropriate to bring up the fact that despite clearly being nuts, Phil Spector was a heck of a producer and a force in rock music. I've been reading Tearing Down the Wall of Sound by Mick Brown, and thought you might enjoy some stuff about Phil. --Phil Spector is an accomplished jazz guitar player. 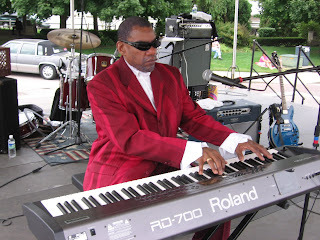 In his early years, he played on recording sessions with the Drifters and the Coasters. --While Phil adopted several children, he's had biological children as well. On Christmas Day, 1991, nine-year-old Philip Jr. died of leukemia. --Phil loved the Ramones. He thought they were the best rock and roll band in America. He produced "End of the Century" which came out in 1980, their most commercially successful album. --The Beatles recorded Spector's "To Know Him Is To Love Him" on a demo for Decca Records--and were rejected by the label. The song, by the way, was based on the epitaph on his father's gravestone: "To Know Him Was To Love Him." Spector's father, Ben, committed suicide in 1949. Phil idolized his father, and apparently has never gotten over his death. Phil's mother, Bertha, would tell him when he was a kid: "Your father killed himself because you were a bad child." --Sonny Bono worked for Phil Spector as a gofer, promotions person, back-up singer (along with Cher) and what-have-you. --Narrows' alum Leon Russell played keyboards on a number of Phil Spector's productions. --Phil's actual first name is "Harvey," which is what his family called him when he was growing up. Nothing says lovin' than the holidays at the Narrows. 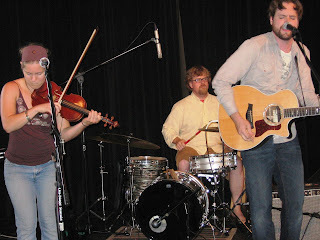 When we last checked in on these Narrows' faves, they were touring in support of their terrific CD "Trailer Life," one of the best rock 'n' roll records you'll hear. The Drunk Stuntmen's music is kind of Southern rock, kind of country (they do a terrific revved up version of "Whiskey River"), kind of Tom Petty-ish, kind of rootsy--but 100% fun. Come to this one even if you've never heard of them. A great New Year's present to yourself. You'll love 'em! www.drunkstuntmen.com. By the way, they're working on a new CD! 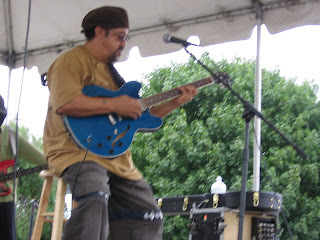 He's the guitarman for many in the Rhode Island area and in faraway places as well. Not only is he a master bluesman (he founded Roomful of Blues), he's a master entertainer who'll have you smiling and tapping your feet. If you have a spouse, partner or friend who's not necessarily a roots fan, this is a good "date night" concert, because the Duke knows how to put on a show for everybody. www.dukerobillard.com. Total class with sass, baby. The Faces will tour the US & UK next year--yeah, the Rod Stewart/Ronnie Wood faces. 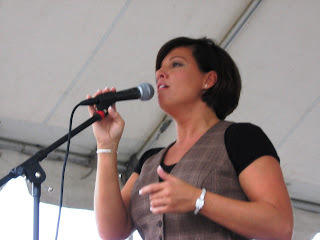 Just emptying the photo vaults from the recent Narrows Festival of the Arts. Above it's Ryan Fitzsimmons and his rockin' band--a rare sight, since Ryan is mostly known by Narrows patrons as a solo act. 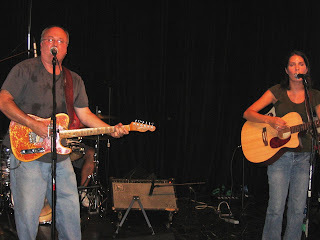 Down below it's Louie Leeman and Cheap Sneakers along with Jeri Karam. 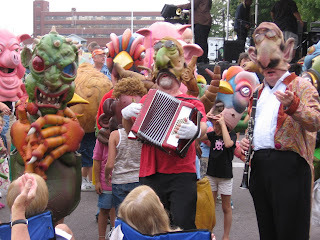 And finally, Biz Nazo puppets lead the children's parade at the festival. Would You Come To See The Chesterfield Kings? Your humble blogger is always looking for the latest thing, even if it's retro. The Chesterfield Kings, hailing from Rochester, NY, apparently were instrumental in fostering the 1980s' neo-garage band movement. Lately, they've been making noise with their first release on Little Steven Van Zandt's Wicked Cool Records, "Psychedelic Sunrise." They appeared on Conan O'Brien's show a few days back. Question: Would anyone from our loyal Narrows audence (or otherwise) come to see them? 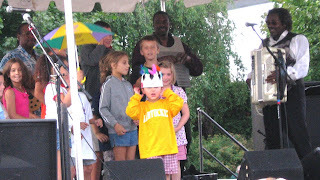 The Big Easy was a big time part of the Narrows Festival of the Arts. Pianist Henry Butler & guitar whiz Leo Nocentelli teamed up for a set to prove it. More photos from the Narrows festival of the arts. 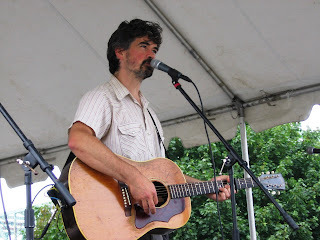 This time jazz songstress Cassandre McKinley (we love her tribute to Marvin Gaye CD, btw) and folk singer/songwriter extraordinaire Slaid Cleaves. If you have photos you took at the festival and would like to share, please leave a comment and a link below. It was a helluva day, Sunday. The Narrows Festival of the Arts went on without a hitch--despite sometimes threatening skies--playing to a packed crowd who turned Anawan Street, just outside the Narrows doors, into a zydeco dance party. At least at the end, which is where we'll begin. 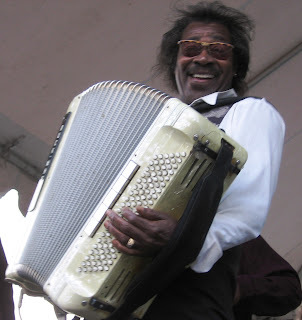 Buckwheat Zydeco wrapped up the day beginning about 5:45 p.m. with music that brought the crowd to its feet for most of the the hour and a half performance. Buckwheat and his group were determined to make everybody smile, including the kids! More fotos of other performances will be posted soon. If you have any to share, please leave a comment with a link. Congratulations to Narrows president Patrick Norton and all the volunteers for putting on a celebration that will be long remembered. With the Narrows on a bit of a hiatus, your humble blogger has been doing different things to pass the time. Labor Day your humble blogger swung by the Ghost Hunters' office in Warwick, RI...the front of the office looks different than on the TV show (it's been remodeled and there's no TAPS sign), but we went behind the office and spotted the familiar TAPS van from the SciFi Channel show "The Ghost Hunters." TAPS, I believe, stands for "Trans-Atlantic Paranormal Society" or something like that. Very cool article in Vanity Fair by the enduringly cool Dominick Dunne who bumps into Phil Spector in a men's room at a courthouse where the "Wall of Sound" madman is on trial for murder.